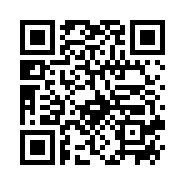 The classic Shakespeare piece Romeo and Juliet, a tragic love story between two teenagers from opposing families, has been redone again and again in different periods and different worlds. 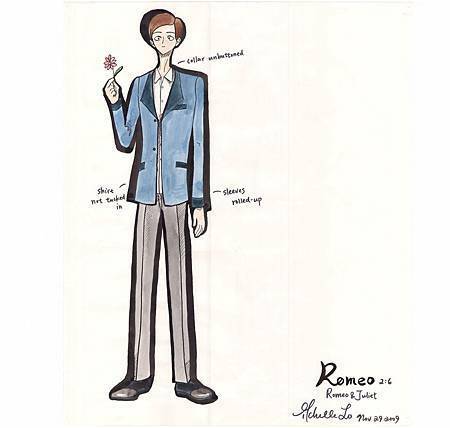 This project is to design the costumes of Romeo and Juliet with the styles of England in the Swinging 60s. The Capulets are a wealthy artistic family who loathe the equally well-to-do yet uptight, old-fashioned Montagues. She is only 13 or 14 years of age. It is important to express the innocent and immaturity of Juliet. It is because of her youth that she does what she does for love, thus evoking the tragic ending. 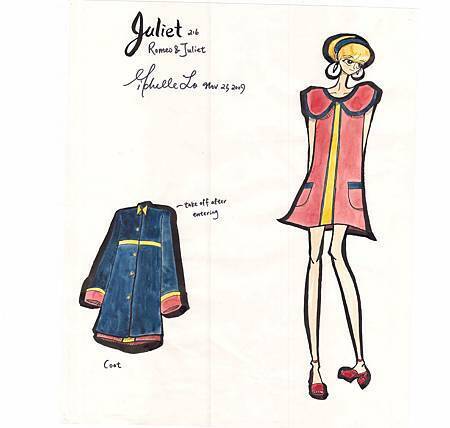 Being of the Capulet family, she is the height of fashion of her period. Her style is inspired by Twiggy, the popular fashion model of the 60s. 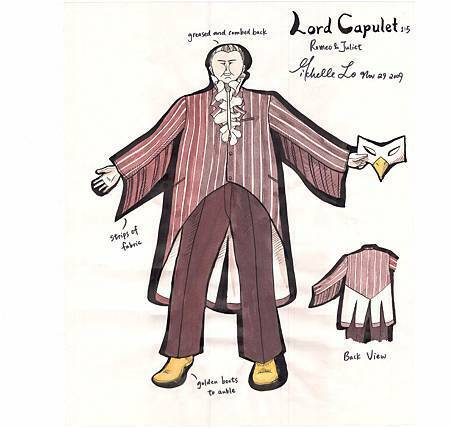 The head of the Capulets, Lord Capulet can be both controlling and festive. 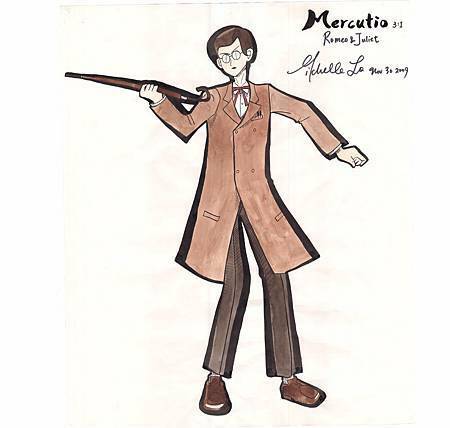 This is the costume he wears at the ball: a suit designed with the style of the eagle, showing his power. 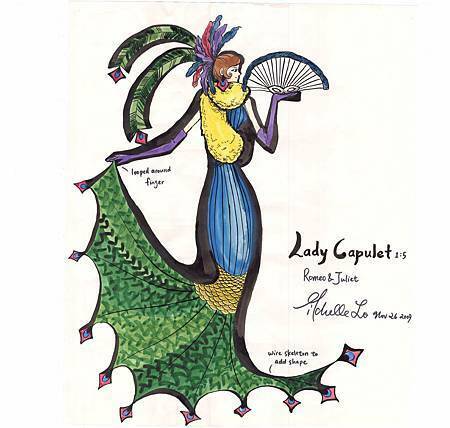 Although she is Juliet's mother, Lady Capulet is still young. She had Juliet when she was 14, making her only about 28 in the play. Her emotional reactions towards the events in the play shows her youth. She dresses herself up as a peacock to the ball, showing off her glamour. Juliet's cousin is a hot-tempered and strong fighter. He strongly follows the ideals of the Capulet family and is willing to fight for his family's honour over anything. He secretly hides a sword in his umbrella, which he uses to kill Mercutio in a duel. 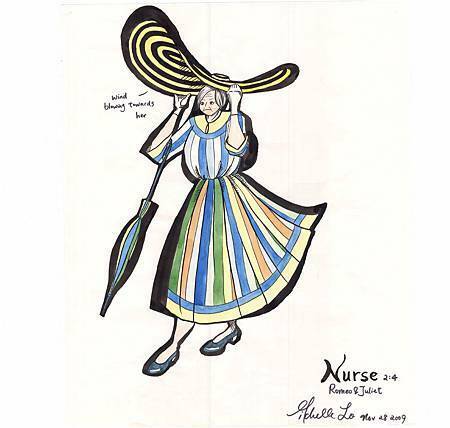 More of a mother to Juliet than Lady Capulet, the nurse is one of the few people who know about the romance between Juliet and Romeo. 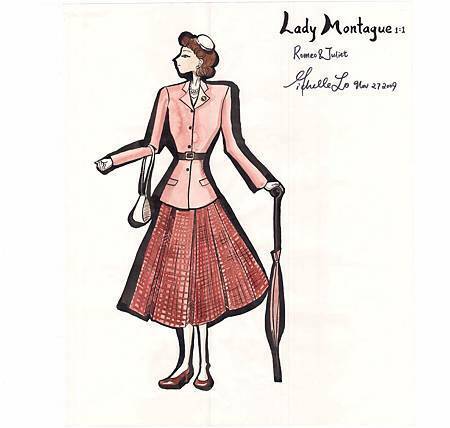 She is much older than Lady Capulet, and thus wears a more old-fashioned costume. However, she does put effort into making herself fit into dress of the family. Young and yearning for love, Romeo quickly moves from his futile love for Rosaline to the Capulet's only daughter, Juliet. His decisiveness is both a strength and a weakness, for he doesn't think much before he takes action. He immediately kills Tybalt after the death of Mercutio, and he kills himself upon seeing the body of Juliet. 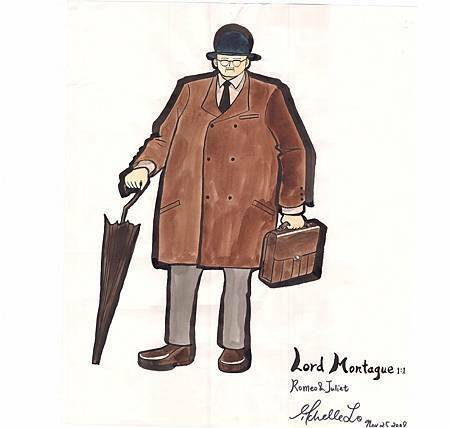 Although he is a Montague, he makes sure he dresses up a bit for the sake of Juliet. Although he doesn't know about the romance between Romeo and Juliet, he worries about his son's romantic relationships, yet is never able to make his son listen to him. He is dressed in a "proper" 50s style suit. Very protective of her son, Lady Montague dies of grief when her son is banished from the city. She wears a 50s style dress. 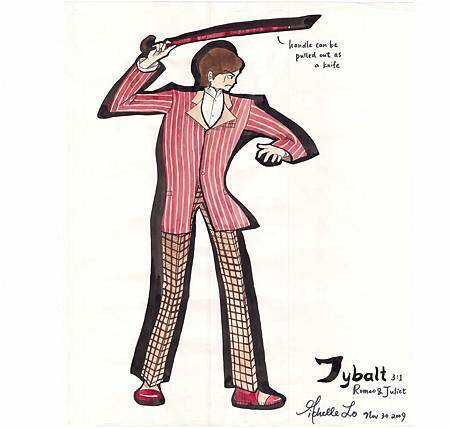 A flamboyant, humourous, and reckless boy, Mercutio often insults Tybalt and thus brought about his own death. He is the cousin of Prince Escalus and a good friend of Romeo's. Neither a Capulet or a Montague, he is free to roam about the two families. The appearance of the Prince of Verona at the end of the play is when the feud between the two opposing families finally has a bit of a resolution. He points out the meaninglessness of the rivalry and its horrible consequences. 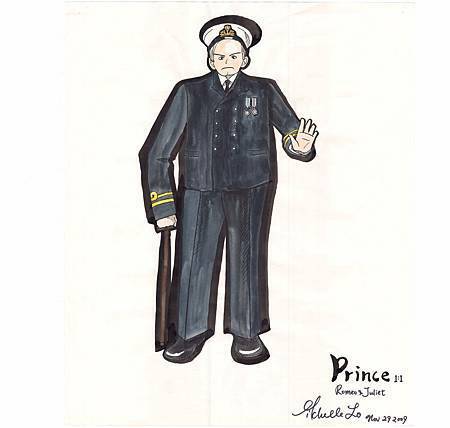 The Prince is dressed like Prince Charles.